The first major film to be distributed for free exclusively through a mobile phone has been released to the public. Downloadable in seven parts, Rage has a star-studded cast – featuring the likes of Jude Law, Steve Buscemi and Eddie Izzard – and has been directed by Sally Potter. Although the movie has been available in bite-sized DLC for the last week for iPhone users, it is now having its full-length mobile phone premiere, courtesy of interactive IPTV platform Babelgum. The makers of the film are calling Rage the "first feature film to premiere exclusively on mobile phones." They also describe the mobile format as something that "links directly to Sally Potter's vision for the film, as Rage tells the behind-the scenes story of a crisis at a New York fashion house through a series of intimate interviews, as if shot by a schoolboy on his mobile phone over a seven-day period." The premiere is set to be a multimedia event, with the movie also debuting online, at the cinema on digital screens and DVD simultaneously. 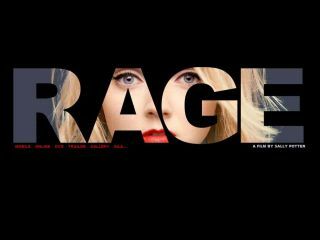 Find out more about Rage at www.ragethemovie.com/mobile. Also, tune into Babelgum tonight for the premiere of the film, which will showcase an interactive Q&A with director Potter live from the BFI Southbank in London.